We, at Supercampers, now consider ourselves lucky. First is, of course, for receiving support from IPKO Foundation and second, on our first chance given to experience and document one of the most motivational event so far. It’s the case of this courageous young girl, who went rock climbing with us, in her very first experience outdoors. Rock climbing – not the easiest one to start with. All of our attention was at her, as she seemed to be the weakest point in the long chain of more than 20 people. And it only seemed, she proved herself to be the role model of everybody in the group. 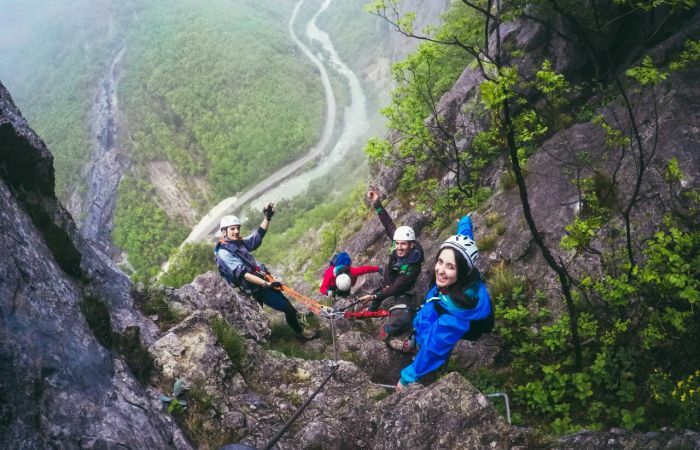 What made her such an inspiration was her courage and dedication despite the fear and the feeling of uncertainty in every step she took, and while climbing Via Ferrata in Peje, you got too many steps. So many of them, one by one. Imagine the courage. The day was not the best one for pictures, but this whole thing was more than just one beautiful picture. IPKO Foundation provided us the necessary tools to be able to document young people explore their young country and show the world but also show other young people that by attending a healthy activity like hiking or climbing you get to see wonderful spots our country has to offer.